Carbohydrates are essential to life and thus the enzymes that catalyze the breakdown (glycoside hydrolases) and synthesis (glycosyl transferases) of these molecules play critical roles in biology and have many practical applications in medicine and biotechnology. For example, cellulose and related xylan are the most abundant forms of carbon on earth. Accordingly, the hydrolases that breakdown these carbohydrates have enormous "green chemistry" roles in food, textile, paper, and fuel production. Conversely, compounds that inhibit the action of glycoside hydrolases and glycosyl transferases may help control diseases such as microbial infections, diabetes, and cancers. 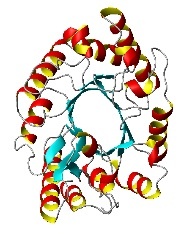 Therefore, these enzymes remain the subject of intensive research directed towards understanding and manipulating the mechanisms by which they build or degrade their carbohydrate substrates. The general theme of our research program involves using NMR spectroscopy as a "molecular microscope" to examine several model glycoside hydrolases and glycosyl transferases. Our primary goals are: (i) to define the electrostatic changes occurring along their reaction pathways by measuring the pH-dependent charge states (pKa values) of catalytic amino acids; (ii) to investigate the roles of molecular motions in substrate binding and subsequent breakdown or synthesis; and (iii) to use this information to tailor these enzymes for biotechnological applications such as paper bleaching under high pH conditions.